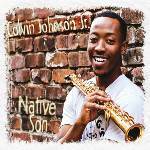 On Calvin Johnson’s 2012 debut, Jewel’s Lullaby, the then-27-year-old New Orleanian blew tenor saxophone on modern-jazz material backed by a band of his peers. This time out, Johnson picks up the soprano saxophone to perform a program of traditional jazz with an ensemble primarily filled with veteran players. The reedman, who comes from a musical family that includes his equally versatile late uncle (saxophonist/clarinetist Ralph Johnson), has long felt at home and is adept in both styles. It’s natural that Johnson should open the album with a selection by the legendary New Orleans soprano saxophonist and composer Sidney Bechet. “Buddy Bolden Stomp” proves a lively way to get the session started with trombonist Stephen Walker having some fun playin’ his horn kinda dirty. Other Bechet works include the quieter “My Woman Blues” with Gerald French providing the perfect accompaniment to Johnson’s beautifully moody rendition. Bechet’s “Petite Fleur” is renewed by the Carl LeBlanc’s thoughtful banjo that begins this fine arrangement of the classic song. The lightness and spirited rhythm that marks Johnson and his band’s execution of “Struttin’ with Some BBQ” and other chestnuts just screams that these musicians are either from New Orleans or at least have been around its music for a long time. With perfect tonality, Johnson weaves his soprano through the choruses of “Struttin’” much like a clarinet, an instrument he played as a youngster. Calvin Johnson is a native son and blows like one—from his roots, his heart and with knowledge of the New Orleans tradition.